Catch the Waves at The Best Beaches in Los Angeles! The Best Beaches in Los Angeles! Everyone knows that Los Angeles has some of the best weather in the country. And when you have great weather, of course, you have to take a trip down to the beach. But, with so many great beaches to choose from, where do you start? Beach lovers staying in Los Angeles hotels in downtown, here’s a list of some of the best beaches in the Los Angeles area. The Leo Carrillo State Park is an excellent place for all kinds of beach activities. Here, you can swim, surf, or go windsurfing! There are also trails that you can go hiking at! Leo Carrillo is excellent if you’d like to camp out on the beach. So, bring your camper and enjoy the beach! 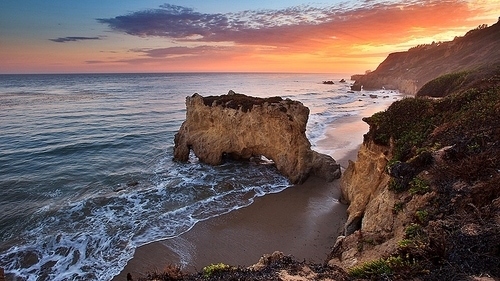 Another great option is El Matador State Beach. Located in Malibu, it’s one of the most beautiful beaches that the city has to offer. There are steep stairs to get down to the shore, so, unfortunately, this beach is not handicap accessible. However, this is an excellent beach for bodyboarders and bodysurfers. Parking is FREE at the lot. If you want a unique experience, head over to the Venice boardwalk. There are many vendors along the boardwalk, so feel free to peruse through them. You’ll find things from jewelry to arts and crafts to clothing. Venice Beach also includes Muscle Beach, handball courts, beach volleyball courts, bike trails, basketball courts, and a skate Dancing Plaza. An iconic landmark of Los Angeles is the Santa Monica State Beach. At Santa Monica, you can go to the pier that is home to the only amusement park on a pier in Southern California! There is also a fantastic promenade blocks away from the beach where you can shop and eat. For a classic beach experience, head over to Manhattan Beach. There are surfers, sunbathers, and volleyball courts. You can also ride the South Bay Bicycle Trail, which is a great place to jog or bike. With Downtown Manhattan close by, you can make a day of it and go shopping or dining after a fun day spent at the beach.